What is a tribe? What is tribalism? When you think of great moments in your life, did they involve other people? Perhaps being part of a winning sports team. Or being a member of a club dedicated to a mission. Or maybe getting in trouble with friends in high school. All of these experiences involved groups of people coming together. My guest, Sebastian Junger, has a lot of insights about the human need for connection. His theory is that human beings crave strong social bonds. While this observation may not seem unique, in Mr. Junger’s book, Tribe: On Homecoming and Belonging, he argues that many veterans suffer when they get out of the service because they miss the strong, intimate relationships that they had when they were in. Furthermore, what is called post-traumatic stress disorder or PTSD has become a catch-all term for veterans that are simply alone, depressed, and struggling to make sense of their service in a society that values the individual over the community. This is where Mr. Junger’s book hits home and stirs up some much needed dialogue. Check out the interview we had. Also, I provide a lot of links and resources for veterans at the end of this commentary. Mr. Junger’s book was published in 2016, and was well-received. Whether one agrees with his thesis or not, there is no doubt that the book will stimulate important conversations. I was drawn to several points in our interview such as the difference between how people live in modern society versus how military units live together. On deployments, military personnel will typically live next to each other in close quarters. During field training, military units will also sleep very close together. There is a common joke about how close Marines will sleep to each other when it gets cold outside. Essentially, if it is cold, Marines will find themselves practically snuggling with another member of their fire team or squad. No one judges because they are probably doing the same thing. Additionally, units will always have a rotating sentry on watch to look after the group. Mr. Junger’s point is that it is an experience that is truer to our evolutionary hard wiring. This experience feels good because it is how we were meant to live together. As we follow this point to Mr. Junger’s conclusion, veterans miss these experiences. Thus, often veterans are not nostalgic for war and violence rather they feel an intimate loss of the brotherhood and connection that can be completely “intoxicating.” They may also be missing a good night’s sleep. In our interview, Mr. Junger touched on the ability of catastrophic events to bind a community. At the present moment, he talks about not feeling close to his neighbors in New York City. However, after the attacks on September 11, Mr. Junger recalls the city becoming a tighter community- i.e. a closer tribe. People came together in the face of adversity and hardship. Moreover, crime rates went down. Also, rates of suicide and depression also decreased. His book explores some additional examples of this phenomenon such as the London Blitz. London officials expected panic and hysteria. But, the opposite occurred. People were surprisingly resilient. Additionally, Mr. Junger’s career was spent following a civil war in Bosnia during the 1990’s. The siege of Sarajevo brought an enormous amount of suffering and pain to the residents of that city. However, Mr. Junger mentions that after the siege, several survivors yearned for the close bonds they felt toward one another when community survival was at stake. Everyone had to pull their weight and as such everyone had a job to do. Everyone was a valued member of the community. We try not to get too political in the interview. But, it is worth noting the extent to which American politics has become a toxic form of tribalism. Each political party has a tribal identity and spews hateful rhetoric at the other side. The question I pose to Mr. Junger is whether a nation so deeply divided into warring political tribes can survive. In his book, he writes that if an adversary wanted to destroy the United States, the best tactic would be simply to sit back and let the U.S. destroy itself from within. There was obviously an element of this that occurred through Russia’s social media meddling in the 2016 presidential election. But, it is worth pointing out that veterans go abroad and serve their country only to return to a country that seems to be at war with itself. And it isn’t just political rhetoric. I will never forget the moment that I returned from the field in 2012 only to hear about the Sandy Hook shooting in Connecticut. It was a moment of deep sorrow. We had been training in the desert of 29 Palms, CA. As we drove back to Camp Pendleton, I remember sitting on the bus with my rifle in my lap and being struck by a bitter irony. We had trained for a month to defeat a foreign adversary and to keep the American people safe. But, in one morning, one disturbed individual senselessly murdered innocent American children. And it got worse. Around the time I was getting ready to deploy, stories emerged about how the victims parents were being harassed and threatened by conspiracy theorists, who were fellow American citizens. As an active duty Marine committed to defending my country, every tragic case like Sandy Hook is extremely depressing. What can be done for our veterans? There are a lot of fantastic resources and organizations dedicated to helping veterans. “Thank you for your service” is a hollow phrase. On the other hand, saying “thank you for your service, let’s help you find the right job” is a better phrase. 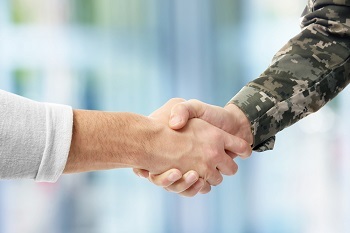 There are a lot of organizations dedicated to helping employ veterans (see below). At the end of the day, veterans want to serve and give back. The best way to do that is with meaningful employment. Mr. Junger talked about the rise in disability claims. There is an interesting irony that today’s wars have less casualties (thank God) than wars in the past. However, more disability claims are filed than in past wars. Today, the Veterans Administration (VA) wants all veterans to have their medical records screened and to file a claim if needed. Additionally, they will establish service connected disability based on four criteria: Direct, aggravated, presumptive, and secondary. “Direct” is an injury or condition tied to something that happened while someone was in the service. For example, an individual breaks their back fast roping from a helicopter. Second, “aggravated” is a prior injury that may have went away. But, service in the military brought it back or made it worse. Third, “presumptive” is an assumption of a cause and effect condition. For example, there was an incident of contaminated water supply at Marine Corps Base Camp Lejeune in the 1980’s. The VA presumes a service connected disability if a veteran who was exposed to that water supply develops a disease that might be linked to the contaminated water. Finally, “secondary” conditions are caused by a previously identified service-connected disability. For example, if someone had a broken arm, and later on they began experiencing shoulder pain. The VA might identify this as a secondary injury related to the broken arm. The VA’s mission is “To fulfill President Lincoln’s promise ‘To care for him who shall have borne the battle, and for his widow, and his orphan’ by serving and honoring the men and women who are America’s Veterans. Check out the VA’s website at www.va.gov. There are many excellent resources to help Service members find new career paths after the military. Go to https://www.careeronestop.org/ and locate an American Jobs Center in your region.